129I, of which the half-life is 15.7 Ma, had presented its potential of geological dating in the range of 2-80 Ma. However, researches on dating in terrestrial system using 129I were scarce due to its extremely low content and possibly complicated variation in the terrestrial environment. By using the newly established ‘carrier free iodine coprecipitation’ separation method, scientists from Institute of Earth Environment, Chinese Academy of Sciences, investigated the iodine isotopes, 129I and 127I, in the loess-paleosol sections from the Chinese Loess Plateau (CLP). Their findings were published in GEOCHIMICA ET COSMOCHIMICA ACTA. 129I/127I atomic ratio was found to approximately vary within (2.0±1.0)×10-11 in most samples except those in the upper 1-2 m, which obviously undergone the anthropogenic product contamination. The scientists were surprised to find that the observed 129I/127I level in the deep layers is one order of magnitude higher than the initial value reported for the marine system. Possible anthropogenic migration and excessive fissiogenic 129I from uranium isotopes were proved to have negligible impact on the iodine isotopic ratio based on the estimation of migration distance as well as the measured uranium content. Low 127I content in the terrestrial environment caused by the limited exchange between marine and continent was proposed to attribute to the higher 129I/127I ratio in the terrestrial environment. 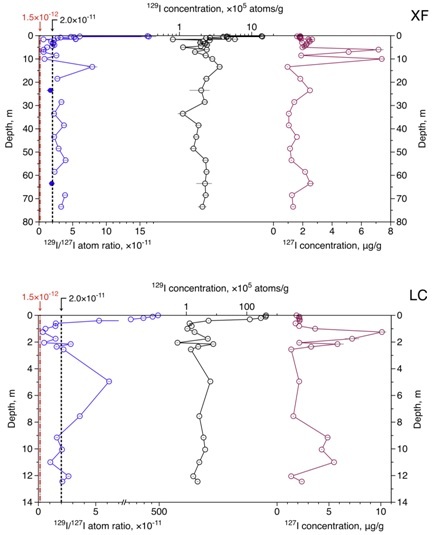 These findings may provide new insight into the complex composition of natural iodine isotopes in the terrestrial system and help constraining the pre-nuclear 129I level therein in the future for dating the terrestrial materials using 129I.